BAXT CosMedical® has a full complement of clinically proven state-of-the-art anti-aging lasers and light source technologies to help you look younger and treat many medical dermatological and cosmetic skin concerns, including acne, acne scars, rosacea, sun damage, hyperpigmentation, hair removal, skin tightening and a large array of non-surgical, minimally invasive procedures for men and women of all ages. Dr. ​Rebecca Baxt​ and Dr. Saida Baxt, board certified dermatologists, are specifically trained in treating skin problems and helping patients achieve healthy skin. At BAXT CosMedical® we own all our lasers so they are available all day, every day. We advise patients to be cautious of practices and medical spas that rent equipment monthly and only perform lasers on those days. Also, it is advisable to check the credentials of doctors from other specialties (non-dermatologist), who have limited experience and are not experienced laser specialists that have a thorough understanding of the technology and your skin. You want an experienced Board Certified Dermatologist performing your laser treatments. 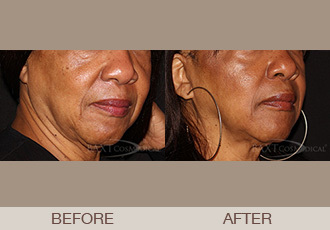 All laser treatments are performed by our Board Certified Dermatologists at BAXT CosMedical®. At our comprehensive medical and cosmetic dermatology center we also offer many light-based skin treatments. These involve multiple wavelengths of light whereas, lasers have 1 wavelength. Isolaz®, Photofacial/Photorejuvenation, Photodynamic Therapy are light based treatments that harness the power of to noticeably improve your skin, reduce skin aging from sun and environmental damage, and reduce acne, redness, and hyperpigmentation.